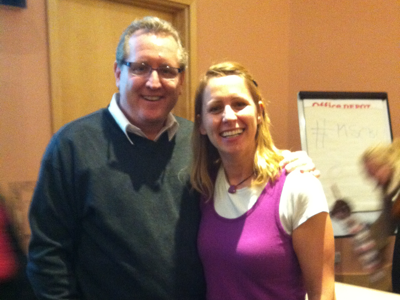 Last month, I had the amazing opportunity to meet Mark Schaefer in person. He delivered a talk at Oxford Brookes University and generously answered our many, many questions about the future of digital, and the impact for individuals and organisations. I created an article over at Storify about the first part of that talk. It includes some tweets from the audience, using the hashtag #msobu. This is a shortened version of that story. Enjoy! I don’t really need to say that the business environment has changed beyond recognition over the last 20… 10… even 5 years; that gone are the days when products were sold (mostly or, even, solely) over the counter, when deals were made (mostly or, even, solely) on the golf course, and partnerships agreed (mostly or, even, solely) on networking events up and down the country. We all know that face-to-face contact has been increasingly replaced by interaction mediated by several forms of digital technology. But what are those forms and what do they mean for marketing? Luckily for students, staff and members of the wide Oxford Brookes University community, this was exactly the focus of a talk that Mark Schafer delivered at the Business School, during a recent visit to the UK. Mark explained that not only digital technology mediates the interaction between the firm and its customers, but that various forms build upon each other. In effect, there is a layered effect, increasingly creating a divide between the firm and its customers. The talk examined 6 such layers. The ubiquitous adoption of websites means that customers can learn about the product without having to talk to one of the company’s employees. And the move towards transactional websites means that firms can do business with customers without ever meeting them. Increasingly, though, websites are not the customers’ only – or even the primary – destination. Someone looking for information about your product or company, will not only see your website, but also come across information in other websites. For instance, if you searched for information about Mark’s hometown, you might come across various resources on Flickr, YouTube and Slideshare, to name a few… and not all depicting the town in the best light. Firms need to think beyond the website, and also consider the other elements in the customer’s information eco-system. In fact, Mark went further and said that firms had to ‘methodologically and patiently build (their) story on the information ecosystem’. Social Media – love it or hate it, there is no getting away from it. Because, you see, for many people social media is more than a website. It is lifestyle. That’s why Mark Schaefer call this the engagement layer. For a very significant proportion of the population, Facebook (or the leading ‘local’ social network) has become the Internet – the way they access information, communicate and, increasingly, spend their money. Oh, yes they do! Farmville and, now, the app store are just two examples. And before you dismiss this layer as a quirkiness that marketing managers in consumer markets have to deal with, remember that, in business to business (B2B) interactions, the first stage of the (long) purchasing cycle is done online. Indeed, in reply to a question from the audience, Mark said that he felt that social media was particularly important for B2B markets. According to mobiThinking, as of February 2012, there were 5.9 billion mobile subscribers worldwide – that’s 87% of the world population. More than 85% of new handsets are web-enabled phones and an increasing percentage of web-users only access the Internet via their mobiles (25% in the US, higher in other parts of the world). Organisations also need to consider carefully their mobile advertising strategies, and the impact of mobile payment systems in their businesses. Augmented reality imposes a digital layer over the physical world. Its applications are varied, from games to military, shopping to education. And these are the early days, only. AR may soon be embedded in contact lenses or glasses, providing truly rich, personalised experiences, without customers ever needing to log on to a computer. We love playing. And we love to play games. We like progressing through levels, acquiring new skills, earning new widgets and so on. Knowing that, more and more organisations are adapting ideas from game playing to the way users consume their products. This approach is called gamification. Gamification brings together 3 drivers of human behaviour: motivation, ability and triggers, as explained in this article. By integrating the three, organisations can create truly engaging experiences for their customers. Each of these layers brings its own challenges and opportunities. It brings challenges because different layers require different strategies, because it requires significant investment, and because the rate of change is accelerating. But it also brings opportunities because there are numerous opportunities to connect with the customer, and to create customer satisfaction and loyalty. It was a truly interesting presentation. Thank you, Mark. Did any of these layers surprise you? Personally, I had not considered the information eco-system. It was obvious that it had to be included, once Mark mentioned it… but it was not something that I had specifically acknowledged. What other elements would you include? Indeed very interesting. The layers did not surprise me, but what I think is important of his message is to look at all of them. There are not many ‘social media experts’ that acknowledge such a holistic approach.What I would add to it, is a ‘convergence’ level. Increasingly, especially with the layers ‘mobile’ and ‘Augmented Reality’, people are accessing the information, or sharing information (layer 2!) when they do something ‘off-line’. This is a great opportunity to bring everything together. It’s social check-ins, for example, or ‘foodspotting’. But so much more. Great example is the happiness machine of coca cola ( http://youtu.be/lqT_dPApj9U ), the summer camp in Israel (also Coke – http://youtu.be/SSZ9v8oUaRY ), the improv campaigns from t-mobile ( http://youtu.be/NB3NPNM4xgo ) or the Tesco/Homeplus subway store ( http://youtu.be/fGaVFRzTTP4 ). The summer camp video, Arjan, is taking the ‘you haven’t lived it until you shared it’ idea to extreme, isn’t it?As a marketing buzz initiative it is genius; but (for me) it is also a bit disconcerting to see this level of sharing and ‘publishing’ of one’s activities. I wanted to share with you a comment posted on Twitter (as a response to this post).One user mentioned the role of search engines and I think that he has a great point. On the one hand, they could be seen as part of the eco-system. But, on the other hand, it surely has changed how consumers find about (or, indeed, search for) the product. Hi Ana, I think the summer camp is indeed taking it to the extreme, but it’s a great example of the possibilities. In an example I know of, similar technology was used at a marathon in Italy. I think we’ll see more of it. I’m working for a charity, and we are going to launch something like that (but not with RFID, with QR codes) here in Latvia soon. It’s less extreme than the summer camp example, though, but it might help us in becoming one of the best known charities in Latvia.